I also offer a 45 minute ‘tiny riders’ session for 1-3 pre-schoolers. Ideal as a birthday (personalised electronic gift vouchers available) or other celebration or as a special gift or treat, or a pony day out. Your keen pony equestrian(s) or animal lover(s) will enjoy approximately half an hour grooming and decorating a pony followed by approximately half an hour riding in our pretty Orchard. The children share one pony unless you request a second pony. There’s plenty of opportunity to ask horsey questions and I share some of my horsey knowledge and tales from a lifetime with equines. We often chat about the animals, fruit and trees in the orchard. Following their experience your child will be presented with a small pony-themed gift chosen by us or you can opt for the gorgeous cuddly soft toy gift at a small extra charge. Your child does not require any riding or pony experience to enjoy activities here. I’m happy to entertain children older than 10 with more pony management (learn about the care of the ponies eg putting rugs on, what brushes to use for what etc) but their legs are usually too long to actually ride! We have a very tiny (only 36″ to her shoulder), pony, Poppy, who is ideal for smaller (from age 2) children to brush, stroke and ride whilst Skittles is suitable for children up to 10 years. Both ponies are suitable for most special needs children to groom and ride. Session leaders have a number of year’s experience of ponies/horses and working with children and will tailor the experience around your child’s age, confidence and preferences. Feel free to find out more about Amanda here or what visitors have said here. 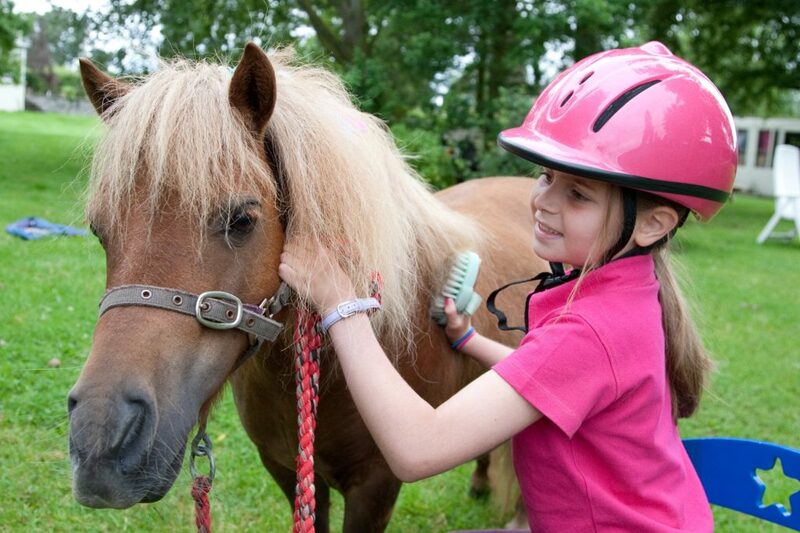 Experience a Pony is £50 for one child, £25 each for additional children for an hour. These are available at a discount every Monday. A small gift is included -if you’d like your child(ren) to receive a gorgeous cuddly soft toy in a pony party bag with a couple of other pony themed gifts these are £5 each child. If you’re coming to celebrate your child’s birthday your child may appreciate the birthday experience which includes a big birthday rosette and all participating children also go into the paddock to stroke all the ponies – a big favourite with visitors!!! Pony experiences are available all year round. Term time week-end bookings April to September can only confirmed 14 days prior to the event as we are generally busy with parties. We can sometimes take bookings for late afternoons (from 4.30pm). Week-day bookings and week-end bookings October to March will be confirmed (usually) within 2 working days of your booking.